That’s what you hear when you reach Sarah Presley’s voicemail. After getting to know her the past 5 years of the Lexus LaceUp Running Series, it’s all too fitting. 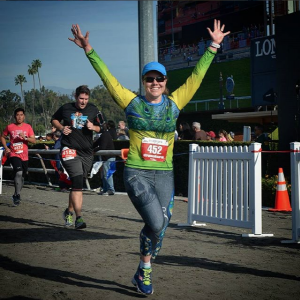 After suffering an unexpected brain aneurysm in her twenties, crossing the finish line became more than just a physical accomplishment. It was Sarah’s way to heal. 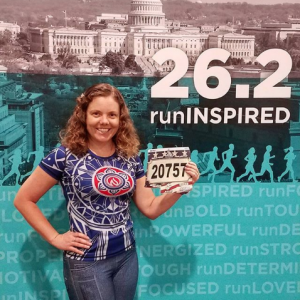 For Sarah, running started with one mile with a friend and just days later grew to the declaration to train for a marathon. She walked into to her first training meeting a little naive to what she had signed up for. “That’s where I found out the marathon was 26.2 miles,” she laughs. Halfway through training for her first marathon, she already had plans to train for her second. That grew to the goal of running a marathon in all 50 states. She had caught the ‘running bug’ and was ready to take on the challenge. However, on September 6, 2012, Sarah faced a challenge she never saw coming. After returning home from the Burning Man music festival and settling in to watch a movie with her boyfriend, she noticed something was off. “It literally felt like a pop in the center of my head. A little burst of pain that quickly filled my entire head,” she remembers. Chris, Sarah’s boyfriend (now husband), assumed it was dehydration. The moment she put water to her lips she began vomiting. Chris called 911, and when the paramedics arrived, she was unable to sit up. It felt like her entire body had gone rigid. She was unable to walk out to the ambulance. She could run half marathons in her sleep, but in that moment, she couldn’t even walk a few steps out of the bedroom. At the hospital, a CT scan revealed her diagnosis—a brain aneurysm rupture. Doctors informed her that with the size of aneurysm she had, people normally just drop dead. She shouldn’t even have made it to the hospital. After surgery, the doctors delivered more shocking news. She was diagnosed with aortic coarctation, a heart condition she had unknowingly had since birth. Her doctors couldn’t believe she had been able to run down the block, let alone a marathon. Recovery was slow, but Sarah didn’t settle. She started by getting out of her hospital bed and walking to the bathroom. Her head was swimming, and she was in and out of consciousness, but doctors told her she’d recover faster if she took on the challenge. “That was the right thing to say with my personality,” she laughs. After she was discharged, she started walking to check the mail multiple times a day (even when she knew it hadn’t come). Walking became jogging. Jogging became running. Her heart surgery took place December 2012. In February 2013, she completed the Pasadena Half Marathon. Sarah will tell you that the physical recovery wasn’t where she struggled most. She was only 29 when she suffered her brain aneurysm rupture, and her biggest challenge was relating to people. “I didn’t know anyone else in my age group that had been through anything even remotely comparable to what I was going through,” she says. She joined online support groups, but the other survivors were significantly older. She struggled to find common ground with them. A year and a half after her brain aneurysm, Sarah completed her first full marathon since the rupture. Rock ‘n’ Roll San Diego. The very same marathon as her first-ever marathon. Despite the time that has passed, not a day goes by that Sarah doesn’t think about what happened. 40 percent of people that suffer a brain aneurysm don’t survive, and 60 percent of those that do, suffer a permanent handicap. Those statistics changed her perspective. She lost the sense of “bad things can never happen to me,” and feels more inclined to do things that make her happy. “You don’t know what life has in store for you,” she says. “Never stop pushing forward.” That’s the legacy that Sarah wants to leave behind. “Take everyday one step at a time and always have a goal in mind,” she says. Since her aneurysm, Sarah has completed 122 half marathons and 18 marathons. This year, she is looking forward returning to the Lexus LaceUp Running Series and adding to her long list of post-aneurysm races.